Check your UCS CPU heatsinks! Tonight I unboxed and installed several new UCS blades. I’ve done this quite a few times, and I’ve never had an issue. After inserting the blades into the chassis I went back to my desk to verify blade discovery. All was well, except one of the blades reported a “thermal-problem”. 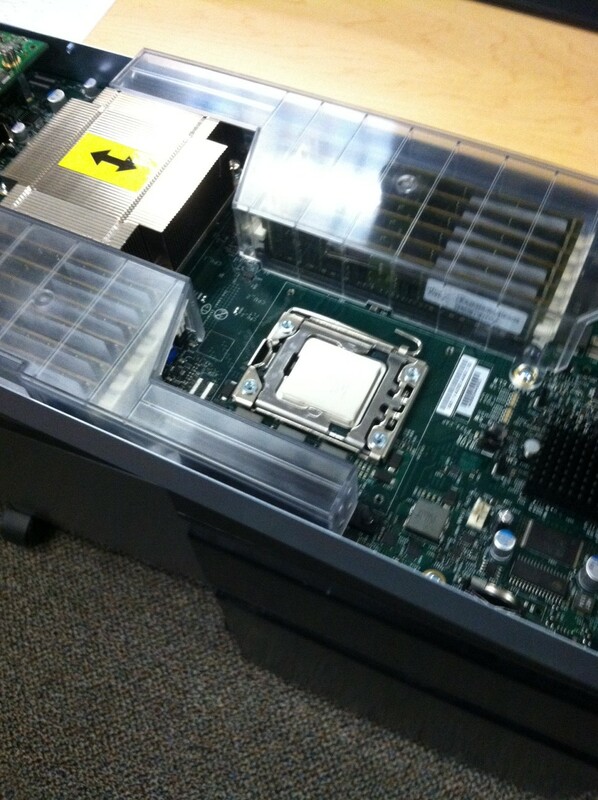 I removed the blade and its cover, and to my surprise the #2 CPU heatsink wasn’t secured from the factory! I bolted the heatsink down and reinserted the blade, but alas the error eventually came back. I’d say the CPU got fried when the FI’s turned on the blade to execute discovery. Oh well, back to Cisco it goes for repair. I’ll be checking the CPU heatsink status on every new blade I install from here out! Guess this B200 was built on a Friday.